Gold Award aspirants from St. Mary's School, Safdarjung Enclave, New Delhi took part into Residential Project in March 2015. They called it A Journey towards self-transformation. Read their experience about this project. A path towards change may have obstacles and difficult situations but the path leads to the creation of life changing experiences. 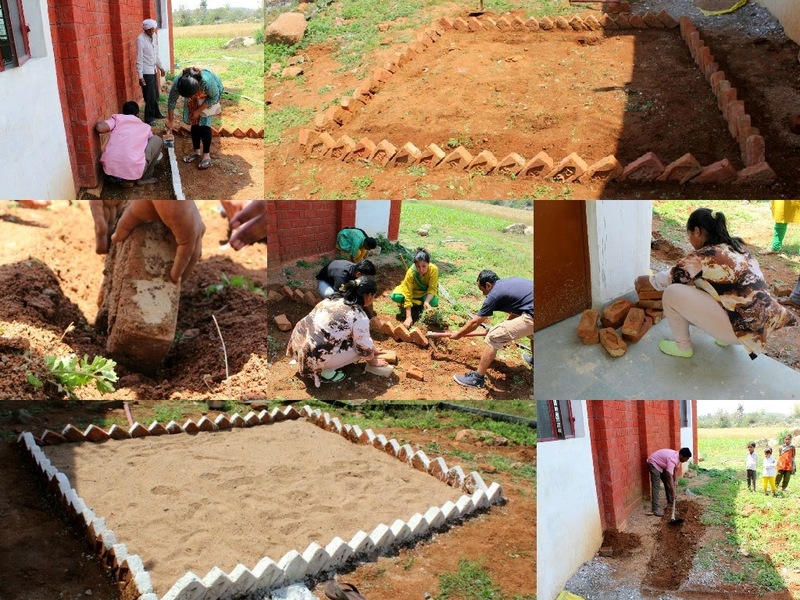 Eight Award aspirants and four mentors went for a Residential Project on 24th March, 2015. The aim was to familiarize our selves with the lives of the children, women and men of Azadpura, near Orcha, Bundelkhand and to raise awareness about education and health. The area is largely neglected by the government in the areas of education and health. Some words spoken by our mentors helped the bonding and communication with the twenty students of the Azadpura School and the community. Children with eager glittering eyes were hopeful that a beautiful future was round the corner. Classrooms filled with small children with big dreams colored our thoughts of them. The first thing that came to our minds was connectivity and so we started with circle time and some music, which made the environment comfortable for all of us. The only obstacle we felt at that moment was the reticence on their part to participate freely. Through this particular obstacle or block in our first step we understood that there was something lacking on our side. We realized that we hadn't devoted enough time to get to know each other. That particular time to think and grasp other's problem and issues was missing. The space which defined the time to think was missing. The lack of understanding and bonding with the community propelled us to conduct a transit walk to discuss various issues with the community. The discussion raised issues of their present condition and the problems that they were facing as well as their limitations. On the second day we conducted a drawing session with the children to allow for some creativity. The children made some awesome drawings reflecting their individual feelings, likes and dislikes. Creativity was further enhanced when we played some music. Eventually every inch of the class was filled with happiness and creativity and the children were active stakeholders in creating this little change. Our aim to create bonds with the community was not limited to the students/children. We indulged in a cooking session with the women of the community. The group was divided into two and along with the community women we cooked a healthy and a love-filled meal. To make every one more comfortable, we played some folk and Bolloywood tunes. Such is the power of music that the women soon started singing and dancing alongwith us. Over lunch the conversations covered a wide array of topics such as lifestyle and family structure to gossip and Bollywood. To impress the importance of formal education and to invite the community for the sports day that we had planned, the medium of street play (nukkad natak) was used. The theme of our play "shiksha humara huk hai" made it easier to redefine the word education. They received the message that we wanted them to join in the fun and expressed their willingness to participate. This was our third step in creating awareness for a more involved and participative future through school and education not only for children but also for older men and women. In the evening we introspected on the day's activities and how to work better in the coming days. The sports day was a huge success. The day started with a Volleyball match that brought us closer and strengthened our bonds with the community. This was followed by a 50m race, 100m race, banana race and the obstacle race. There was a surge of excitement and enthusiasm from the participants and the audience. We also organized the special berry (ber) race for women. We replaced the lemon with the berries as we wanted to use the available resources which would bring them closer to us. The main thing which could be spotted was that all resources used on the sports day and other activities were the resources of the community which was another way of empowering them. Handling the sports day was a huge activity, but we felt extremely rejuvenated and happy on seeing the brimming smiles on the faces of those who won and those who participated. While the winners were acknowledged with medals and certificates others were given a participation certificate for their exemplary efforts. The sports day was followed by the construction of a sand pit. From tilling the ground in hard sunlight, to finally leveling the land and painting the boundary, we were able to relate closely to the working conditions of men and women who work in the field. The task required hard work and vigor to strive and complete it. On completion of the sand pit we were filled with joy & the cherished sense of finally being able to give back profitably to the society. It also gave us a sense of satisfaction as we had succeeded in not only creating bonds with the community but initiating this faith in them, that they could be active catalysts in society. Developing bonds, conducting dialogues, understanding problems and providing incentives were our reflections from the residential trip. Even though the journey to achieve the trust of the community was a difficult process, we learnt how perseverance eventually brings victory.